1. SMART ANTI-LOST: App will remind you in time when you set in anti-lost mode. 2. LEFT PHONE ALERT: Item tracker will make a sound to alert you. 3. ONE TOUCH FIND: One touch to call phone finder and find it with ease. 4. FIND YOUR PHONE: Just one press on App can easily find your phone. 5. LOST & FOUND NETWORK: Millions of Nut App users can help you find your lost items back. 6. GROUP SHARING: Attach one piece of key finder with the remote control, all your family members can easily find it. Android system models: Samsung Galaxy S4, S5, Xiaomi 3, Xiaomi 4. 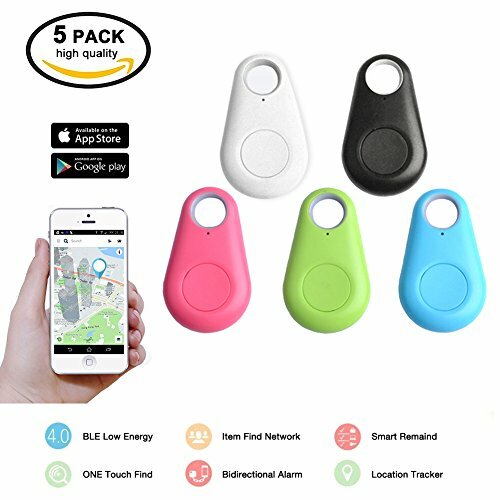 5 PACK SMART FINDER -- it easy to find your misplaced items when you're in Wireless range, just tap a button and your key finder will ring loudly, even on silent. USER-FRIENDLY APP -- Access the tracking app via your tablet or smart phone and instantly track car keys by following the map disconnection point. FAMILY SHARING -- Find and share items with anyone. Can't find the television remote? Track and ring the key finder device from multiple phones and accounts. ENVIRONMENTALLY FRIENDLY -- Super-thin and lightweight to make the key tracker easily fits into your wallet, key ring. 1 Year standby, normal use for 6 months, replaceable battery. If you have any questions about this product by Zyan, contact us by completing and submitting the form below. If you are looking for a specif part number, please include it with your message.